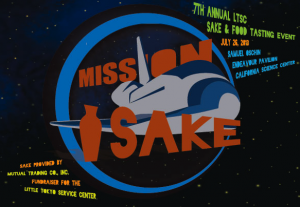 “Mission Sake,” Little Tokyo Service Center’s seventh annual sake and food tasting event, will be held Friday, July 26, from 7 to 9:30 p.m. at the Samuel Oschin Endeavour Pavilion at the California Science Center, 700 Exposition Park Dr., Los Angeles. It will be a unique evening featuring an assortment of sake from around the world and hors d’oeuvres from L.A.’s top restaurants. Sake experts will provide education on sake and food pairings. Guests will see Endeavour up close and discover some of the science behind the space shuttle. The exhibit features images and video to introduce guests to Endeavour’s past missions and the crews who flew them. • Premium sake tasting. Mutual Trading Company is the exclusive sake provider and will offer an array of premium sake and other cocktails. Beer and shochu will also be served. • Hors d’oeuvres from a wide variety of restaurants from the Downtown and Los Angeles area including Bonaventure Hotel LA Prime, Toranoko and Maison Akira. • DJ entertainment. Jeremy Sole from KCRW will be spinning throughout the event. • Silent auction with items up for bid such as autographed memorabilia, show tickets, gift baskets, and many others. • Raffle. An opportunity to win prizes, including two first-class American Airlines tickets to destinations in the continental U.S., the iPad mini, and a dinner for two at LA Prime/Bonaventure hosted by Chef Andreas Nieto. • Networking opportunities. LTSC’s events provide an excellent forum to meet a wide range of stakeholders, including young professionals, community leaders, corporate representatives and local elected officials. Get your tickets early as this event always sells out. General admission is $75 in advance, $85 at the door (limited availability). VIP admission is $150, pre-sale only. The VIP reception includes ultra-premium sake form Mutual Trading’s top-shelf selection, paired with an exclusive tasting menu. VIPs will also receive a commemorative sake cup. Attendees must be 21 and over. For more information, call (213) 473-1608 or visit www.ltsc.org.